The I SEE community has the great pleasure to announce that the first paper on I SEE project has been published!! The paper represents a collective work based on the design of an I SEE model of our teaching modules. This work started from our experiences of the implementation of the climate change module with upper secondary school students. The paper presents our approach and perspectives. The paper is open acces and it is possible to download it here (Paper_I_SEE_2770-9430-1-PB) or directly from this link. For citing the paper, please use the following: Branchetti, L., Cutler, M., Laherto, A., Levrini, O. Palmgren, E.K., Tasquier,G., Wilson, C (2018). 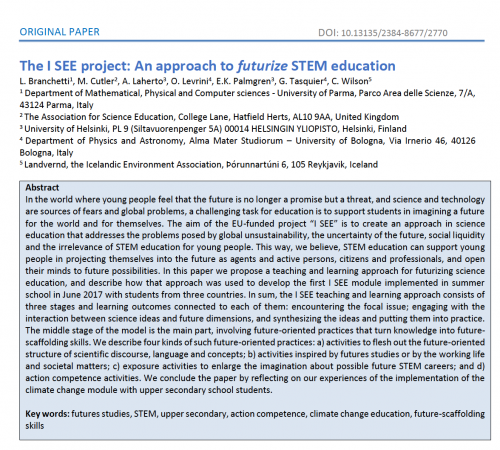 The I SEE project: An approach to futurize STEM education. Visions for Sustainability, 9: 00-00. We will be delighted to receive feedback from our readers. This project has been funded with the support of the European Union and the Italian National Agency within the framework of the Erasmus+ Programme (Grant Agreement n°2016-1- IT02-KA201- 024373). This publication reflects the views only of the authors, and the European Union and the Italian National Agency for the Erasmus+ Programme cannot be held responsible for any use which may be made of the information contained therein.